Keep Rolling comes to you to provide trusted, hassle free vehicle maintenance, services and repairs right at your door step! 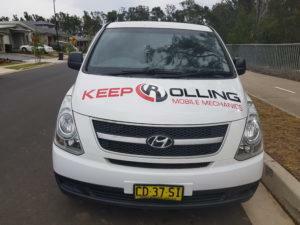 Keep Rolling Mobile Mechanics in Penrith provides all types of vehicle services (cars, motorcycles, scooters, trucks, heavy vehicles) for all makes and models throughout Penrith, Hills District, Blacktown and other Western Sydney Suburbs. Keep Rolling Mobile Mechanics is run by owner-mechanic Brendan. With over 10 years of experience in the mechanics industry, Brendan has a high-level of expertise, experience, and qualifications. Passionate about cars and other vehicles, Brendan really loves fixing problems that others can’t. He states that there’s no better feeling or more satisfaction than fixing a complicated issue to help get his customers back on the road as quickly as possible. Brendan is a Penrith local and looks forward to servicing or repairing your vehicle needs.